Brake discs are used to decelerate vehicles and, especially in the case of heavily-loaded trucks, are subjected to high stress. Brake discs are attached to the wheel hub and provide a contact surface for the brake pads. By friction of the brake pads against the brake discs, kinetic energy is converted into thermal energy. Optimally designed bridges ensure that the thermal energy is dissipated from the vented brake disc. Due to their perfect alignment, even emergency braking does not cause distortion of the brake disc. 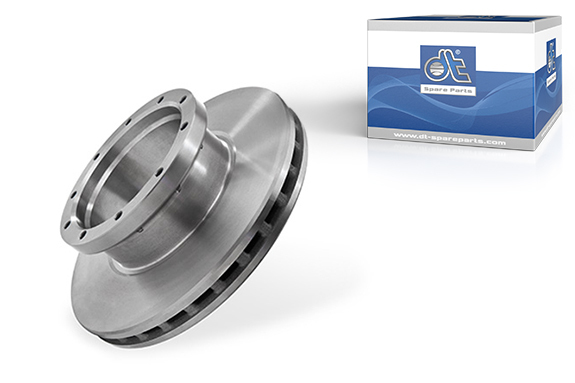 DT® brand brake discs have a surface finish which is optimally adjusted to the brake pads. Thus, a high braking force and the minimum possible wear on both components can be ensured. Each DT brake disc is automatically checked and balanced to ensure equalisation of the radial forces. Special alloy additions contribute to increased wear resistance and reduce cracking.Precise tolerance dimensions ensure easy fitting of the brake discs on the wheel hub. The extensive DT® complete range for the braking system offers, besides all standard brake discs and the matching brake pads, all appropriate installation and mounting kits. DT brake discs are provided with a batch coding for traceability of the production sequence, the DT marking including the article number, and the minimum thickness (in millimetres). Upon reaching this minimum thickness, the brake discs must be replaced immediately to ensure a continued optimal braking force.